This article is about the royal dynasty that ruled Armenia during Antiquity. 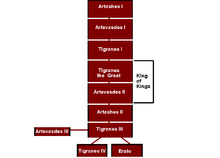 For its cadet branch in Iberia, see Artaxiad dynasty of Iberia. Scholars believe that Artaxias and Zariadres were not foreign generals but local figures related to the previous Orontid dynasty, as their Irano-Armenian (and not Greek) names would indicate. According to Nina Garsoian / Encyclopaedia Iranica, the Artaxiads were a branch of the earlier Orontid (Eruandid) dynasty of Iranian origin attested as ruling in Armenia from at least the 5th century BCE. According to Strabo and Plutarch, Artaxias also founded the Armenian capital Artaxata with the aid of the Carthaginian general Hannibal who was being sheltered from the Romans within Artaxias' court. The population of the previous Orontid capital of Ervandashat was transferred to Artaxata. Over a dozen stone boundary markers have been discovered on the territory of modern Armenia from the time of the reign of Artaxias with Aramaic inscriptions; before their discovery, the existence of these stones was attested by Moses of Khorene. In these inscriptions Artaxias claims descent from the Orontid Dynasty: King Artaxias, the son of Orontid Zariadres. As Prof. James R. Russell states; "It was only natural that the Artaxiad monarchs should declare themselves philhellenes, yet it must not be thought that their religious beliefs ceased to be what they had been of old: staunchly Zoroastrian." Prof. David Marshall Lang adds that the Hellenistic religion and the pantheon of the Classical divinities had undoubtedly become popular amongst the upper classes in the later Artaxiad period. ^ Chahin, M. (2001). The Kingdom of Armenia: A History. Psychology Press. p. 226. ISBN 978-0700714520. The Artsruni Princes were, like the Artaxiads, related to the ancient Orontid line. ^ Garsoian, Nina (2004). "ARMENO-IRANIAN RELATIONS in the pre-Islamic period". Encyclopaedia Iranica. However, the recent discovery in Armenia of boundary stones with Aramaic inscriptions, in which the ruler Artašēs proclaims himself “the son of Zareh” and an “Eruandid king” (Perikhanian, 1966), demonstrates that both “generals” [Artaxias and Zariadris], far from being Macedonians, belonged in fact to the earlier native dynasty, albeit probably to collateral branches, and that the Eruandids, or Artaxiad/Artašēsids as they came to be known, with their Iranian antecedents, continued to rule Armenia as before. An unexpected corroboration of this dynastic continuity is also provided by Xenophon’s much earlier choice of the name “Tigranes” for the crown prince of Armenia in his historical romance, the Cyropaedia (Xen., Cyr. 3.1.7). (...) Except for the occasional princes imposed by the Romans, none of whom succeeded in consolidating himself on the throne, all the dynasties to rule pre-Islamic Armenia were of Iranian stock. ^ Russel, James R. (1987). Zoroastrianism in Armenia. Harvard University, Department of Near Eastern Languages and Civilizations. p. 85. ISBN 978-0674968509. ^ Lang, David Marshall (1980). Armenia, cradle of civilization (3 ed.). Allen & Unwin. p. 148. ISBN 978-0049560093. Grousset, René (1995) . Histoire de l'Arménie des origines à 1071 (in French). Payot. p. 644 pages. ISBN 2-228-88912-1. This page was last edited on 23 March 2019, at 23:58 (UTC).